Before: Sally, a writer, editor, and digital media executive, and Ross, a certified financial planner, bought their two-bedroom apartment in Jackson Heights, Queens five years ago. The 1,100- square-foot home in a 1946 Art Deco building was definitely in need of a renovation, though the space had good bones: hardwood floors, thick plaster walls, and high-coved ceilings. Sally had already been through three renovations in other homes and typically looked for spaces in fixer-upper condition (and at an “unrenovated” price) versus buying a recently remodeled home that’s not her style. ”I know that I can invest in my renovation, get the look and functionality that I want, build equity in my home—and be satisfied with the aesthetic because it’s my design,” she shared. They decided to wait to renovate and see if they should keep the existing galley footprint. It became clear that as a two-cook household, Sally and Ross needed more open space, as they could never fit in the kitchen simultaneously. When the dishwasher was open, it blocked the fridge. Plus, the storage situation, to say the least, wasn’t working. Case in point? To find small appliances in the lower cabinets, Sally had to get on her hands and knees with a flashlight, pulling everything out and back in again. After: After five years of envisioning the kitchen transformation, Sally posted her project to Sweeten. She received matches, interviewed candidates, and then selected a Sweeten general contractor, who “stood out as the best communicator” and really understood the aesthetic she was looking to achieve. “He was able to explain differences in his proposal and the others and showed where his bid foresaw issues the others hadn’t. These were things that were going to come up, and we were going to have to pay for them; he was just calling them out ahead of time. I appreciated that,” Sally shared. Even before posting the project, she had put together two design plans: one with the kitchen totally open to the living area, and another with a partial wall. While she initially preferred the former, once she walked through it again with her contractor and building manager, they discovered water supply, disposal, and gas lines that couldn’t be moved without disrupting service to the building. That meant Plan B, which (spoiler alert!) Sally ended up loving. They moved forward in transforming the dark galley kitchen, leaving it partially open to the living area. Sally knew she wanted all paneled and integrated appliances that felt more like furniture. “I found myself gravitating toward kitchens that banked all the tall pantries with the fridges to one side, like Poggenpohl. I coveted the sleekness of Henrybuilt, with their signature absence of wall cabinets and a ubiquitous shelf running along the tops of the slab stone backsplashes. I fell in love with the shaker cabinetry of Plain English, their wonderfully functional sink islands, and use of slab marble,” she said. 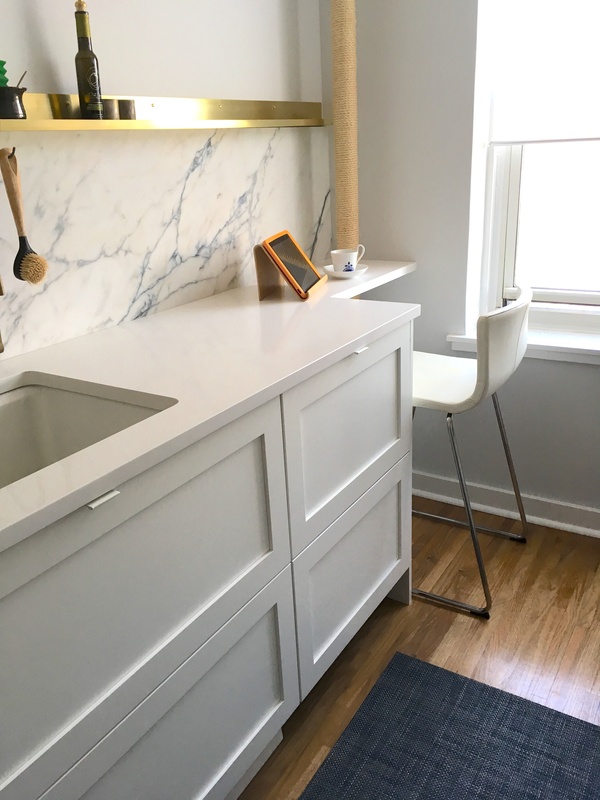 To achieve that look without the price tag, they designed the kitchen using the IKEA planner tool and sent a PDF of the design to a cabinet manufacturer who outfitted the IKEA cabinet boxes with all custom doors. Opting for stock bases saved the couple $25,000! The overall flow is much-improved thanks to the separate wall ovens and cooktop, and the refrigerator is outside of the main cooking area, so it’s easy for guests to grab drinks. The refrigerator is also flanked by tall pantries and cabinets that hold cleaning supplies, including a narrow unit for brooms and mops, and all of the base cabinets have deep drawers with organizers. There’s also a unit of freezer drawers, ideal for Sally who batch cooks on the weekends. Now, a four-time renovator, Sally has a lot of advice to share to fellow and future renovators. Here’s one of her pearls of wisdom: “You’re going to be making so many choices it will make your head spin. Resist the urge to choose the trendiest or fanciest option at every single decision point. You want one thing, like a marble backsplash, to stand out as the focal point, then maybe a few smaller things, like brass cabinet hardware that picks up the brass in the faucets or in the light fixtures. Let the rest of your choices be the plain backdrop that lets these few gems shine,” she said. Bonus: The marble backsplash, which Sally referred to as “the star of the show,” consists of two consecutive slabs. A fabricator book-matched them to create the dramatic arc just above the center of the cooktop. Style finds: Flooring: Contractor restored and integrated new planks where needed. Sektion cabinet boxes, Variera internal organizers, and Nutid integrated wall microwave: IKEA. Solid maple doors: Scherr’s. Cabinet paint in Extra White, SW #7006: Sherwin Williams. White edge cabinet pulls, #9898: Richelieu. Integrated refrigerator, HC #2080: Liebherr. Masterpiece gas cooktop, #SGSX365FS: Thermador. Pull-out range hood, #CRIS36SS600: Faber. Riverby 27” sink: Kohler. Trinsic single handle pull-down kitchen faucet: Delta. Continental single handle water filtration faucet, #KS8198CTL: Kingston Brass. 30” electric wall oven, #VEBIEM301SS: Verona. 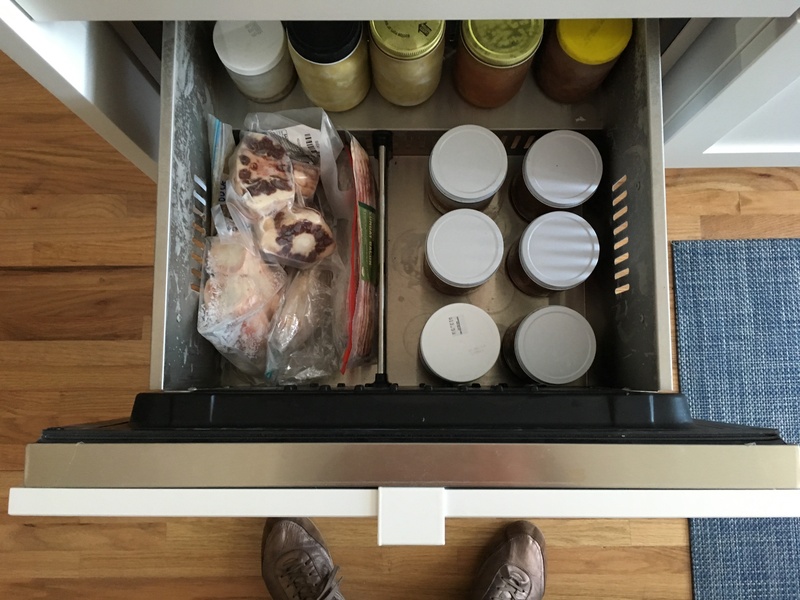 Undercounter freezer drawers, #SCFF532D: Summit Appliance. Quartz countertops in Pure White, #1141: Caesarstone. Italian Poannazzo marble backsplash: BAS Stone NYC; Fabricator: ABF Marble. Wall paint in Blackened, #2011: Farrow and Ball. Boldmfg brass picture shelf; LongMadeCo cylinder drop spot mid-century minimal wall light: Etsy. Looking for more white kitchen ideas? Check out this Scandinavian-inspired cook space. Congratulations, beautiful job and choices for finishes, absolutely timeless and functional. Excellent renovation advice. Is that a chair/writing area near the window? Do you have any other photos that include smart storage ideas? Hint hint! Hi Cathy, Thanks so much for your kind compliments! That is a chair. We needed to regress the countertop to 12″ in that space—to be able to fully open the wall ovens across the aisle. We debated having a narrow base cabinet fill the space, but I wanted a stool where I can perch while reading recipes. Here’s a close up photo of the space, plus a few photos of fun storage tricks. 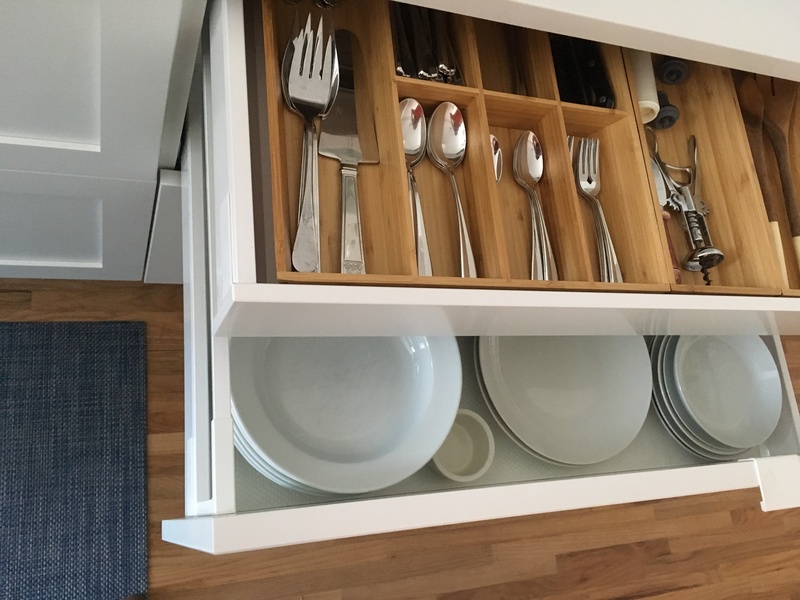 If you’re going the IKEA route, you can install “hidden” drawers within the deep drawers. I added many of these to hold cutlery and cooking tools. But my favorite has to be the spice drawer under the cooktop. When I’m cooking I just pull it out and I can see all of my spices at a glance. 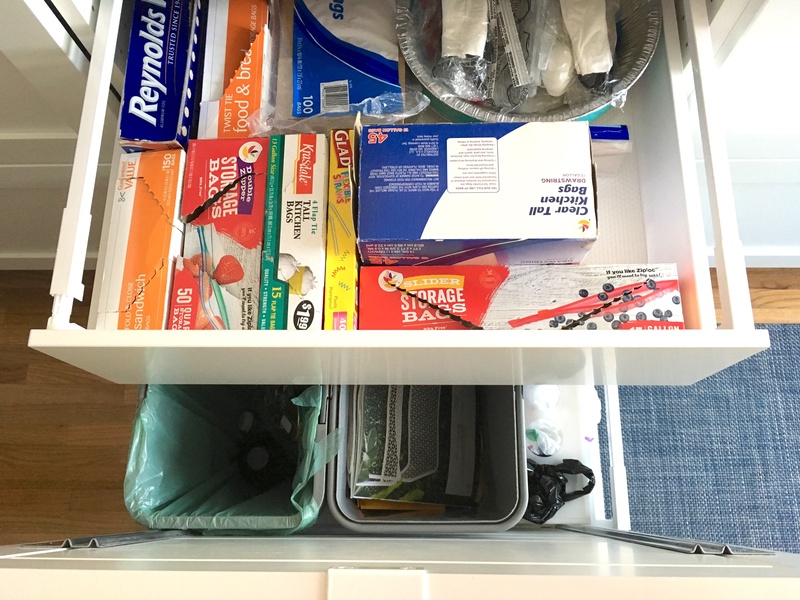 I used two more hidden drawers in the base cabinet to the left of the sink that we use as a recycling station—we keep garbage bags, foil, plastic wrap, and brown bag lunch supplies in there. Here are a few photos. The final photo is the extra freezer drawers under the counter. I just love them.